Abstract: Although many sources of atmospheric CO2 have been estimated, the major sinks are poorly understood in a deep-time context. Here we combine plate reconstructions, the eruption ages and outlines of Large Igneous Provinces (LIPs), and the atmospheric CO2 proxy record to investigate how their eruptions and weathering within the equatorial humid zone impacted global atmospheric CO2 since 400 Ma. Wavelet analysis reveals significant correlations between the eruption of the Emeishan LIP (259 Ma), the Siberian Traps (251 Ma), the Central Atlantic Magmatic Province (201 Ma), the second pulse of the North Atlantic Igneous Province (55 Ma), the High Arctic LIP (130 Ma), and the Deccan Traps (65 Ma) and perturbations in atmospheric CO2. 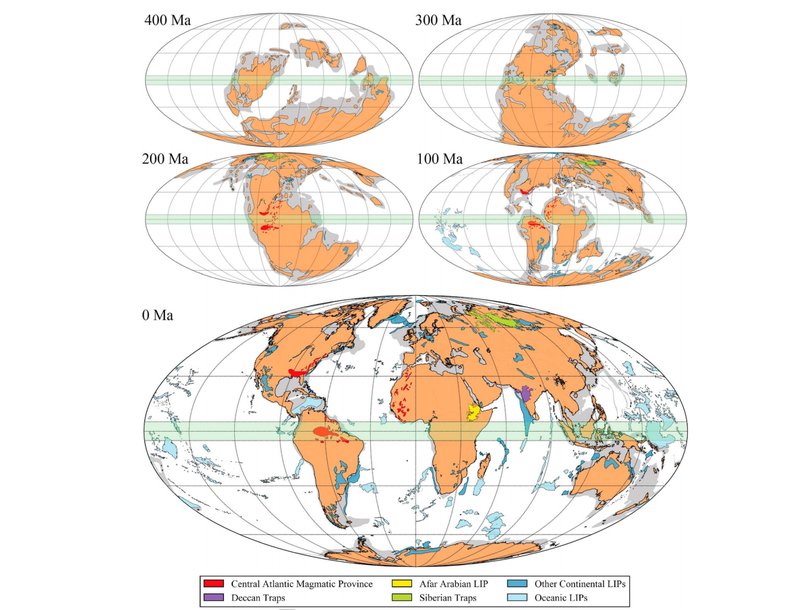 Our analysis also reveals a clear relationship between the weathering of the Central Atlantic Magmatic Province (~200–100 Ma), the Deccan Traps (50–35 Ma), and the Afar Arabian LIP (30–0 Ma) and a significant atmospheric CO2 drawdown. Our results illustrate the significant role of subaerial LIP emplacement and weathering in modulating atmospheric CO2 and Earth’s surface environments. Figure 1. Distribution of LIPs at 400, 300, 200, 100, and 0 Ma reconstructed using the Matthews et al. (2016) reconstruction and the paleogeographies of Cao et al. (2017). LIPs were considered subaerial if they intersected with emergent land. They were categorized into continental and oceanic based of their present day location as well as published categorizations, primarily from Coffin et al. (2006) and Bryan and Ernst (2008). The green band represents the near-equatorial humid belt.